Over the past three years, Hungary has become well-known throughout the world for its resistance to illegal immigration as well as to the demands of the European Union, which has been attempting to force all of its Member States to accept quotas of migrants in spite of the fact that the majority of people in many of those nations are opposed to it. Prime Minister Viktor Orbán of Hungary and his ruling Fidesz party are particularly famous for the construction of the fence that was erected along Hungary’s border with Serbia, which was the route that many of the migrants were taking into the EU before the fence was completed in September 2015. What is less known outside of Hungary, however, is that the fence was not in fact Mr. Orbán’s idea – even though he later became a fierce champion of it – but was in reality the brainchild of László Toroczkai. Mr. Toroczkai has long been respected in Hungary for being one of the nation’s staunchest radical Right-wing activists. After being involved with several other nationalist groups in his youth, Toroczkai founded the metapolitical and cultural youth movement, the Sixty-Four Counties Youth Movement (HVIM), in 2001, at age 23, and was its leader for more than a decade until his departure in 2013. It remains one of the largest nationalist organizations in the country, seeking to unite nationalist youth not only in Hungary itself but also among ethnic Hungarians in neighboring countries. During this period, in 2006, Toroczkai was also one of the leaders of the Right-wing protests that shook the country when it was revealed that Hungary’s then-ruling liberal socialist party, the MSZP, had been lying to the public in order to conceal the fact that it had nearly bankrupted the country with its economic policies. This eventually led to Hungary having to request the first-ever financial bailout from the European Union. Rioting and street-fighting by nationalists took place in the weeks that followed, and were instrumental in bringing down the socialists in the 2010 elections and in establishing the subsequent lock on power that the Right has had on Hungarian politics ever since. Although not a member until 2016, Mr. Toroczkai worked with the Jobbik party from its earliest days, when it was the more radical Right-wing alternative to the more centrist Fidesz, and which has been the main opposition party in Hungary since 2010. In December 2013, he was elected the Mayor of Ásotthalom, a small town of approximately four thousand citizens on the Serbian border, in a by-election, defeating the incumbent Mayor from the Fidesz party with 71.5% of the votes. He subsequently ran unopposed in the October 2014 election. By 2015, László was dealing with the effects of the migrant crisis firsthand. He and his wife and young children were living in a farm located right on the Serbian border, and as thousands of migrants crossed illegally into Hungary, many came across his own property, causing him to worry about his family’s safety. He pleaded for something to be done, but Fidesz at first declined to take action, believing that it was really a Western European problem, given that the migrants were not looking to stay in Hungary but rather to reach nations with lucrative social benefits for immigrants in the West, such as Germany and Sweden. László responded by posting photos and videos of the migrant invasion on social media, which soon began to create a stir in the Hungarian popular consciousness. By the summer of 2015, with the crisis increasing rather than abating, Fidesz began to see that illegal immigration could be a winning issue for them, and adopted László’s suggestion that a fence needed to be built to keep the migrants out. Opposition to illegal immigration has remained the centerpiece of Fidesz’s efforts to this day (some would say to the exclusion of other pressing domestic issues), and was the sole focal point of their campaign strategy in the runup to the national elections that were held in April of this year . Nearly all observers predicted that Viktor Orbán and Fidesz would win reelection, but most also believed that Fidesz’s emphasis on immigration to the exclusion of all other factors of concern to Hungarian voters would lead to a decrease in their majority, and most especially that they would lose the parliamentary supermajority (two-thirds) which is needed for a party to be able to amend the national Constitution without having to work with other parties to do so. Defying expectations, however, Fidesz handily won the election and even managed to retain its supermajority, showing that most Hungarian voters had, in fact, responded to their message and their warnings about what would happen if the opposition parties – several of which received support from the United States and from Soros-backed foundations – managed to regain a foothold. And while the perseverance of Mr. Orbán and Fidesz in adopting, defending, standing by, and expanding upon this idea should not be belittled, it is nevertheless the case that the original impetus for this strategy came from Mr. Toroczkai. Beginning in 2015, Jobbik, which until that time had been a radical Right-wing party and treated as a pariah by the liberal Left (in spite of the fact that they had won twenty percent of the parliamentary seats in the 2010 and 2014 elections), began to reinvent itself as a centrist party, as I have written about elsewhere , positioning itself as the party with the best chance of unseating Orbán in the 2018 election. The migrant crisis had left Jobbik in a difficult position given that, as Rightists, there was little they could do but agree with Fidesz on border policy (although it is nevertheless the case that, when the fence was first suggested, Jobbik opposed it on the grounds that it represented “a return to Cold War barriers”; granted, they later reversed themselves on this), thus losing the momentum that had previously been theirs. Their somewhat bizarre solution was to attempt to link up the radical Right with liberal voters – basically, trying to become the voice of everyone who disliked Orbán. Gone was the uncompromising rhetoric of the past, which had been inspirational to many Rightists both in Hungary and across the world. As part of this new strategy, many of the more radical Rightists that had been part of Jobbik’s leadership for years were purged, or else departed voluntarily. But in the party election of 2016, there was one addition to the Jobbik leadership that was viewed as an offering of sorts to the party’s Right-wing base: László Toroczkai, who was elected Vice President. As Jobbik’s messaging drifted ever Leftwards over the following two years, László often countersignaled their efforts, and even before the election, there were rumors that he would leave afterwards to create his own party. When the election finally came, Jobbik’s strategy did in fact show some signs of success: they managed to hold their own as the main opposition party, and even increased their parliamentary share from 23 to 26 seats, but nevertheless, they fell far short of winning the election or even of depriving Fidesz of its supermajority. Thus, appealing to the liberal Left and moderating to placate them had accomplished little apart from alienating their original base and replacing it with a liberal one. Gábor Vona, who had been Jobbik’s leader since 2006, stuck by his promise and resigned from the party following their defeat. In May, the party held an election to select a new leader, and there were only two contenders: Toroczkai, who promised to restore the party to something more akin to its original vision; and Tamás Sneider, who was perceived as an adherent of the new, moderate line the party had adopted and who was expected to continue in the same vein as Vona (in spite of having been a skinhead in his youth). Toroczkai narrowly lost the election with 46.2% of the vote. 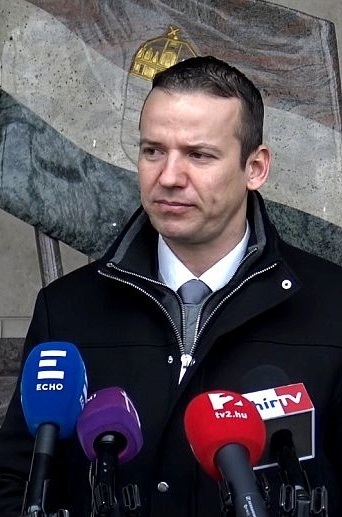 In the aftermath, Toroczkai, speaking with the authority of representing nearly half of the membership, presented the Jobbik leadership with an ultimatum: He demanded that they adopt a policy program that would restore the party to its Right-wing roots or else risk the breakup of the party. This program included such points as putting an end to immigration, taking steps to prevent the emigration of skilled Hungarian workers to the West in pursuit of higher salaries, supporting ethnic Hungarians in neighboring countries, and adopting a tough line on Hungary’s Roma population. 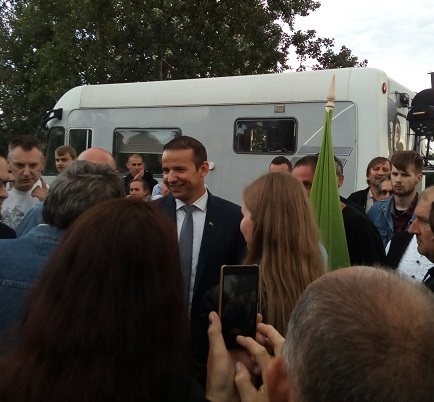 Toroczkai was backed in this by two of Jobbik’s other, most popular leaders: MP Dóra Dúró and her husband, Előd Novák, both of whom had been critical of Jobbik’s new direction and who like Toroczkai were seen as part of the last vestiges of Jobbik’s original staunch radical Right-wing base. (Novák had in fact already been forced to resign his parliamentary seat by the party in 2016 following a statement by him that the biggest problem facing Hungary was its Roma minority, and his position as Vice President was nullified by Vona’s veto.) 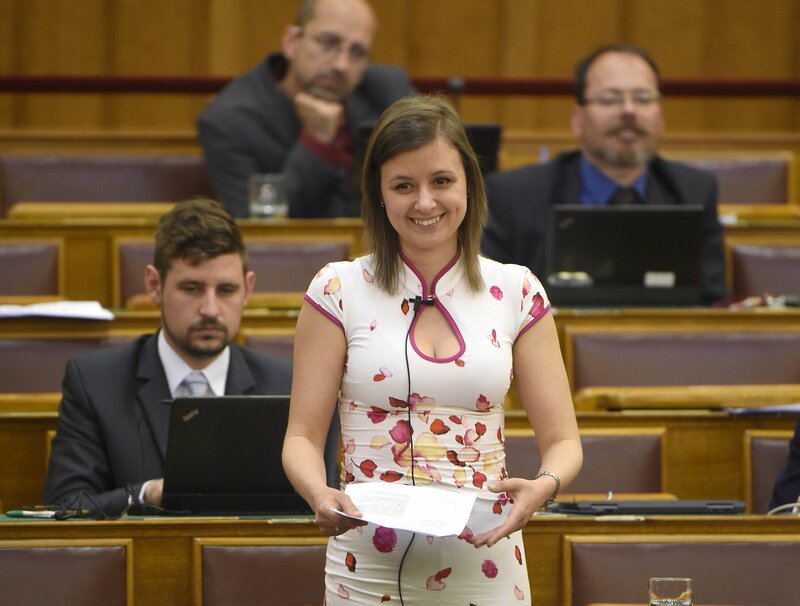 Needless to say, the Jobbik leadership did not take kindly to this ultimatum, and Toroczkai was soon expelled from the party, while Dúró was asked to give up her mandate as a Member of Parliament; Dúró refused and resigned from the party, but retained her seat. Some commentators have suggested that Toroczkai and his colleagues deliberately engineered this crisis in order to be able to say that they were forced out of Jobbik rather than having quit it; regardless of whether that is in fact the case, the outcome could hardly have come as a surprise. Dóra Dúró in the Parliament. After this, Toroczkai announced that he would be forming a new party: Mi Hazánk  (“Our Homeland”), and was joined in this by Dúró and Novák. On Saturday, June 23, the party was officially launched in Ásotthalom, with speeches being given by all three. I was fortunate to be able to attend this event, along with thousands of other enthusiastic and hopeful supporters – so many that the large tent that had been set up for the occasion was filled, and many had to stand and watch from outside. In his speech, Toroczkai said, “We want a Hungary in Europe that will be a white island, whether the European Union survives or disappears.” He also called for a positive vision that would end the exodus of Hungarians westward in pursuit of better wages, which would involve economic reforms. Dóra Dúró also declared that she would be representing the new party in Parliament, saying that she would not hesitate to talk about problems stemming from Hungary’s Communist past, the problems with the Roma, or of the EU’s ongoing attempts to colonize Hungary. Toroczkai giving his speech at the launch of Mi Hazánk. Dóra Dúró speaks with supporters at the launch of Mi Hazánk. It is of course far too early to say what the impact of this new development on Hungarian politics will be, but given that according to recent polls, Toroczkai, Dúró, and Novák were the best-known Jobbik politicians in Hungary other than Vona himself; given that Jobbik remains in disarray following its defeat; and given that its leaders bring many years of experience in politics and a great deal of respect among Right-wingers to the table, Mi Hazánk is certainly well-positioned to make something out of the situation. Whether they can mount a serious challenge to the very popular Viktor Orbán and Fidesz – something even Jobbik has never been able to achieve – remains to be seen, but at the very least they may represent a new force for the radical Right-wing opposition in Hungary. For a long time, Fidesz and Jobbik were in a very useful relationship whereby Fidesz was constantly being pulled further to the Right in trying to head off initiatives from Jobbik; many of the points of Jobbik’s original program were in fact adopted by Fidesz over the years. 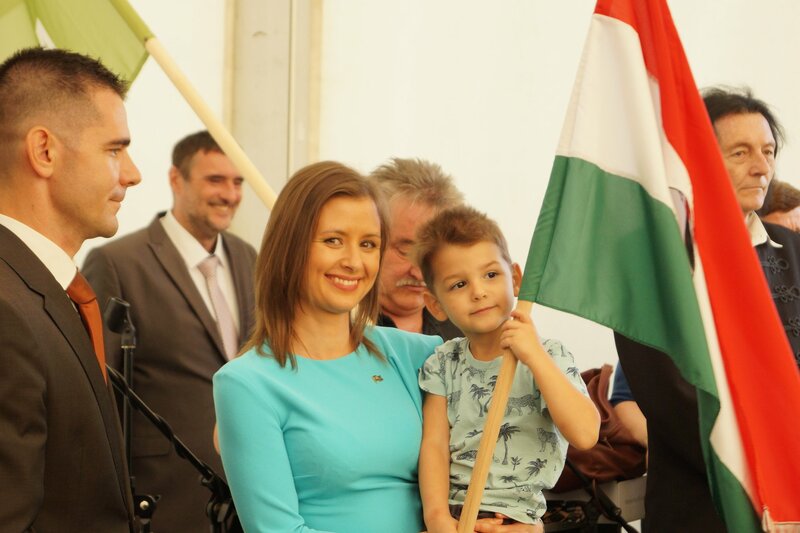 Unfortunately, Jobbik has now given up this role; it is to be hoped that now Mi Hazánk can pick up the mantle where they left off, and continue to keep Fidesz on its toes and prevent it from becoming complacent, or too moderate, in the years to come. A Hungary ruled by Fidesz certainly has much to recommend it, but the fact that movements even closer to the True Right can find fertile ground there is not something that should be neglected. 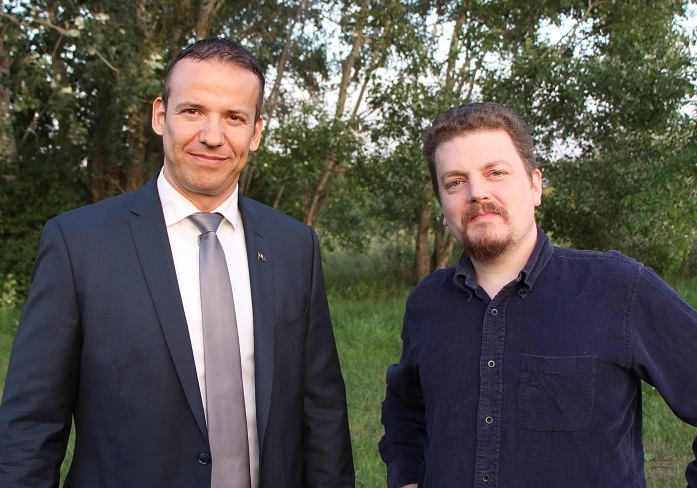 I was fortunate enough to be able to ask Mr. Toroczkai a few questions following the launch event, and the interview, which I conducted on behalf of the Visegrád Post , which provides news and commentary on Central European affairs from a Right-wing perspective, is below. I would like to thank both Ferenc Almássy and Nicolas de Lamberterie, both of the Visegrád Post, for their assistance with arranging and recording the interview and for filling me in on some of the background details that I outlined above, as well as Mr. Toroczkai for taking the time – when he had many other things to be doing – to talk to me. László Toroczkai with the author in Ásotthalom during the interview. Mr. Toroczkai, you’re well-known in Hungary as someone who has been a staunch Right-wing activist for many years now, and for the past two years, you’ve been part of the leadership of Jobbik. What do you see as the reasons for the failure of Jobbik to reach its goals in the last election? I always say that the world is changing, but we must remain where we have always been. We have to remain strong to represent our country and our politics, and I think Jobbik has changed. The President of Jobbik [Gábor Vona] changed his ideas. He went toward the Left and liberal side, and this is not my way. What do you think was the reason for the failure of Jobbik’s strategy? I think that Gábor Vona was interested only in power. He didn’t care about Jobbik’s original principles. He lost the spirit of this community, the nationalist community, and what we had built over many years. I prefer to be loyal to this community because I have been working with it for twenty years. I had to listen to the advice that was coming from a lot of politicians who were telling me that I would never be able to win an election through my ideas and politics. Nevertheless, I was the one who first wanted to put a stop to illegal immigration in my town, and the border fence was my idea. Fidesz was able to win the election with my program and my idea. So I don’t believe in the tactics Jobbik has been using. We can’t just think about tactics and strategy. We have to focus on our people and we need to believe in our principles, our way, and we have to be honest. It’s a very big problem now. Most of the politicians have lost their souls. Sometimes I think they sold their parties and their souls to a few businessmen. Mr. Vona began to cooperate with a few businessmen, such as Mr. Simicska. 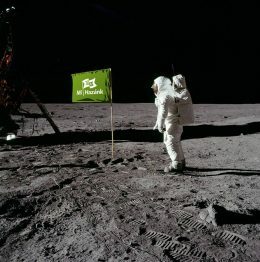 This wasn’t our original way. But I think Mr. Vona’s biggest problem is that he doesn’t know what he wants. He was very close to the Muslims, and he sent Hanukkah greetings to the Jewish community. He is always changing his ideas. I don’t think the people need politicians who are always changing their minds. 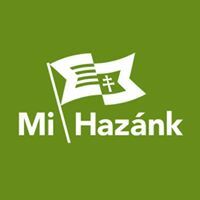 The logo of Mi Hazánk. Congratulations on the founding of Mi Hazánk. What will be the main differences between your party’s program, as opposed to what Fidesz is already doing? What are some of the issues that they are not addressing? 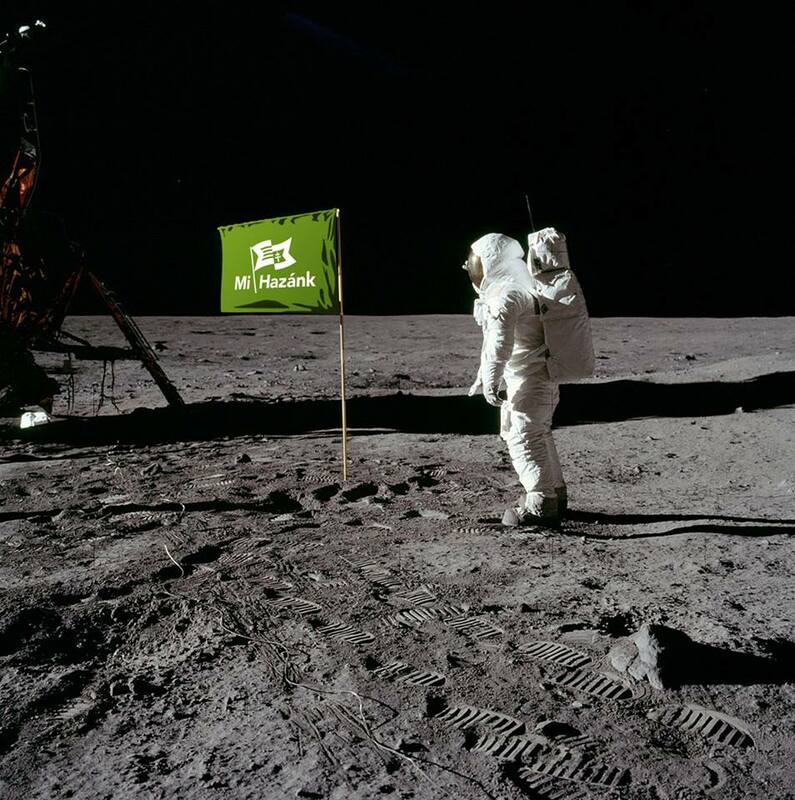 We are still in the process of building this new party right now, so we will have to reveal our program in the future. But I already recognize that there are many differences between our movement and Fidesz. For example, Fidesz never talks about the gypsy problem, which is a very important problem for Hungary, and for the Eastern European region more generally. Also, Fidesz wants to invite Israel to the Visegrád Group. I think Israel shares a lot of responsibility for the destabilization of the countries of the Middle East and North Africa, like Syria and Libya, which were able to help stop illegal immigration into Europe in the past. So I don’t think it’s a good idea to invite Israel to the Visegrád Group. It is an alliance of European countries, and Israel is not European. So there are a lot of things on which I cannot agree with Fidesz. Internationally, Hungary has been best-known in recent years for its conflict with the European Union. What do you think will be the ideal relationship between Hungary and the EU in the future? Do you think it’s something that can be changed, or does Hungary simply need to leave the EU? What do you see as the future of that relationship? Unfortunately, for economic reasons, Hungary cannot stand on its own. The Hungarian economy isn’t independent anymore, since after Communism ended, our government and politicians destroyed the Hungarian economy and destroyed everything. We need an alliance in Europe. And this is my way of thinking also, since although I am Hungarian first, I am also a European. This is very important for me. So I want an alliance between all European countries. I would be happy to open the European Union to other countries, especially to Eastern Europe, such as to Serbia, but only if we can change the politics of the EU. The politics of the EU are horrible right now. It is colonization, both politically and economically. The leaders of the EU are driving it towards a dictatorship. The way in which they want to force mass immigration onto Europe by opening the external borders of the EU is not democratic. There is no doubt that we need to change it, and I would invite other European countries to join it. I think every European country has a place in the EU, but Turkey, for example, has no place. But we have to change the EU’s politics. This is very important. So you think that if the EU expands eastwards, into the Balkans and such, where countries tend to be more conservative, like Hungary, that this could be instrumental in changing the EU? Yes. This is why I would open the EU to other Eastern European countries. We need balance. Right now the EU is like a dictatorship. A few businessmen and politicians from the West lead Europe, and they want to destroy the independence of every European nation. We have to change this situation and we need some balance. This is why I support the idea of the Visegrád Group, because we are in the heart of Europe. To have balance we need both the Western and the Eastern countries to have a voice. Right now there is no equality. 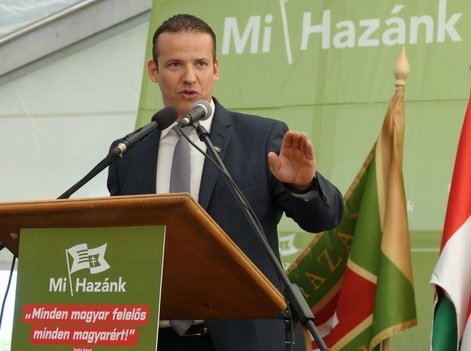 Toroczkai speaks to supporters following the launch of Mi Hazánk. What can we expect to see from Mi Hazánk in the near future? Do you have any plans you can share with us? I will seek to preserve our traditions and our nation. I believe in a Europe that is an alliance and a cooperation between independent nations. I don’t want to change the population of Europe. We need to return traditional values to the people and to families. We need European families. We need European children. We don’t need gender idiotism. We don’t need these crazy liberal ideas. Our goal is to win the next Hungarian election [in 2022] and we would like to send representatives to the European Parliament next year. Many of the people who will be reading this will be Americans. What do you think of the American political situation today, and what do you see as the potential relationship between Hungary and the US? I’m not an expert on American politics, but I was happy when Mr. Trump won the election, because I didn’t support the politics of Obama and these American Leftists. Fidesz’s politics is very close to Trump’s politics, and we can support these good decisions by Fidesz, but we do not agree with them on every question. Do you think there’s any potential for cooperation between Hungary and certain elements in the US? We will see. I would like to see something different in American foreign policy, such as in the Middle East, because I don’t think what is happening in Syria is good, with the Americans sometimes supporting these terrorist groups. So I think we have differences, but I am always open to accepting visitors from America. Some of them have come here to see the border fence, and I have always been ready to welcome them. What is the situation with the migrants in Ásotthalom these days? Everything is all right. Sometimes we are sad because it’s very boring now, we cannot hunt them. But now, Ásotthalom is one of the safest towns in Europe. Thank you very much, Mr. Toroczkai. Good luck! Dóra Dúró at the launch of Mi Hazánk with one of her children; her husband, Előd Novák, is on the far left.